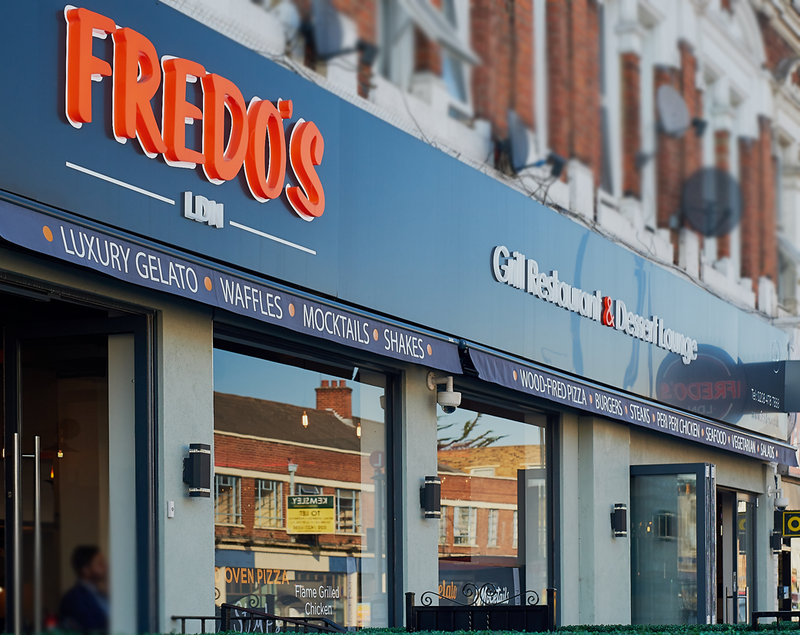 Fredo’s LDN is a Grill Restaurant & Dessert Lounge located in East London, for those who have a love for good food and like to indulge in sweet goodness. All our food is freshly cooked and prepared daily in our kitchen, using 100% fresh, top quality ingredients to satisfy your taste buds. Our menu specialises in gourmet grilled dishes which include freshly handmade wood-fired pizzas using our signature dough to bring out the full flavour of each ingredient, ultimate burgers, succulent steaks, peri peri chicken using our special Fredo’s marinade, seafood full of rich flavours, tasty salads and more! We also have delicious vegetarian, vegan, gluten-free and kids options to welcome all our guests. Enjoy our range of signature drinks and tasty desserts to complement your meal, from our uniquely crafted mocktails, VIP shakes, fresh juices, to our range of handpicked Luxury Gelato flavours, crisp and golden waffles, crepes, cakes and more. You’ll be spoilt for choice! 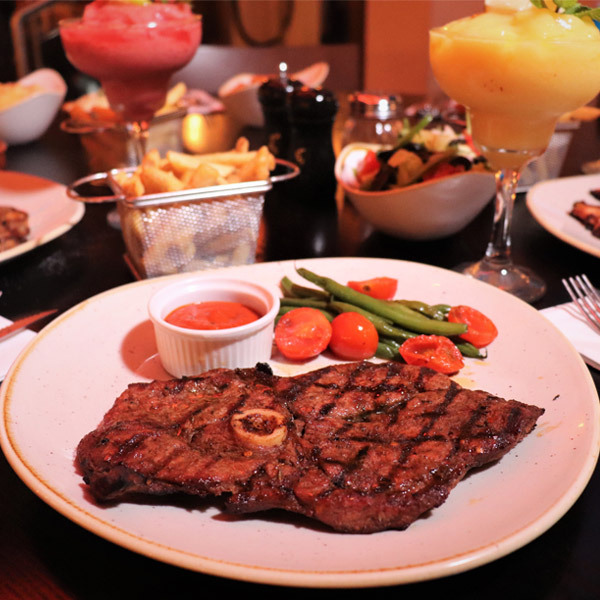 At Fredo’s LDN, we love food, lots of different food, just like you, that’s why we offer a whole variety under one roof. Everything from wood-fired pizzas to peri peri chicken. 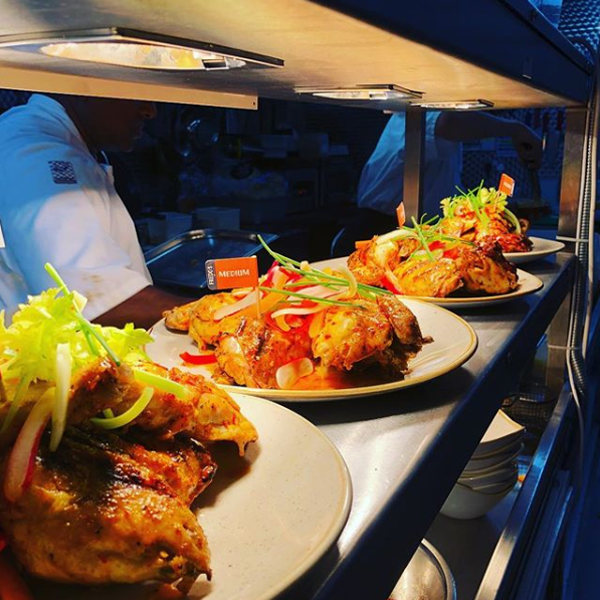 All the ingredients used in our mouth-watering dishes are 100% fresh, healthy, nutritious, freshly prepared daily and so delicious you’ll keep coming back for more! Serving 100% Halal. Don’t take our word for it, come and visit us to find out for yourself. 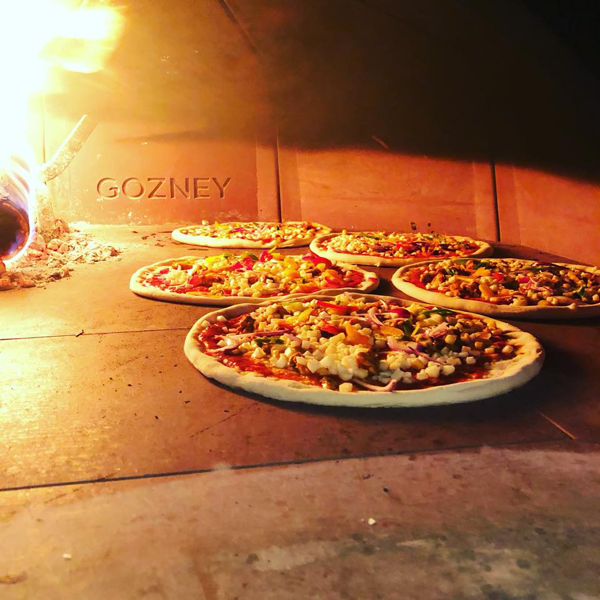 Irresistible wood-fired pizzas freshly handmade to order by our top chefs, using the finest and freshest ingredients to deliver flavourful pizzas time and again. 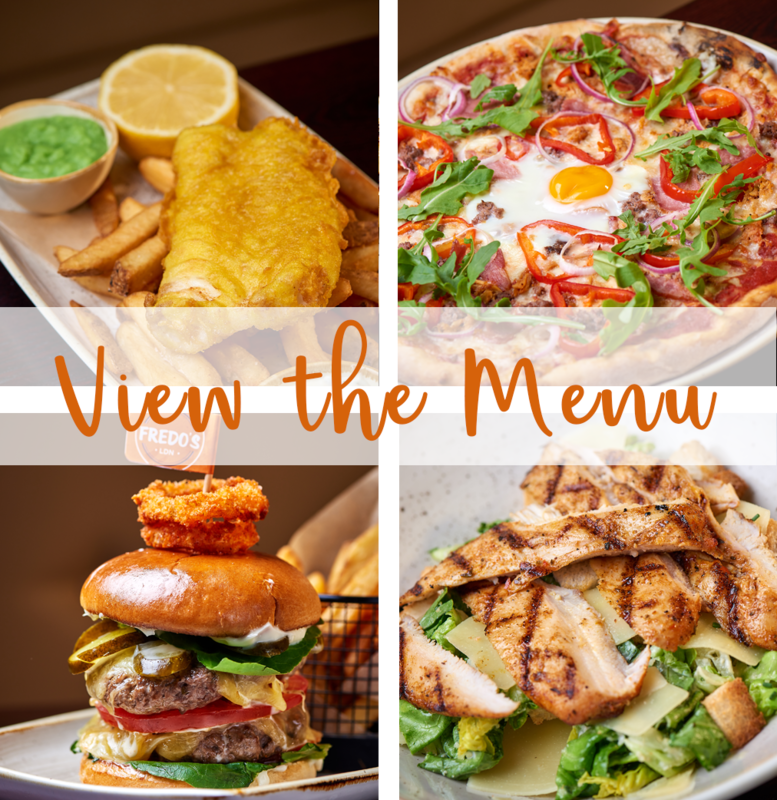 We have something for everyone to indulge in, from the classic Margherita to our Fredo’s Full Feast made using a combination of unique toppings, as well as vegetarian and vegan options. Get ready to dig in! You can’t enjoy delicious food without any drinks, so quench your thirst with our signature drinks made with our Fredo’s signature touch. 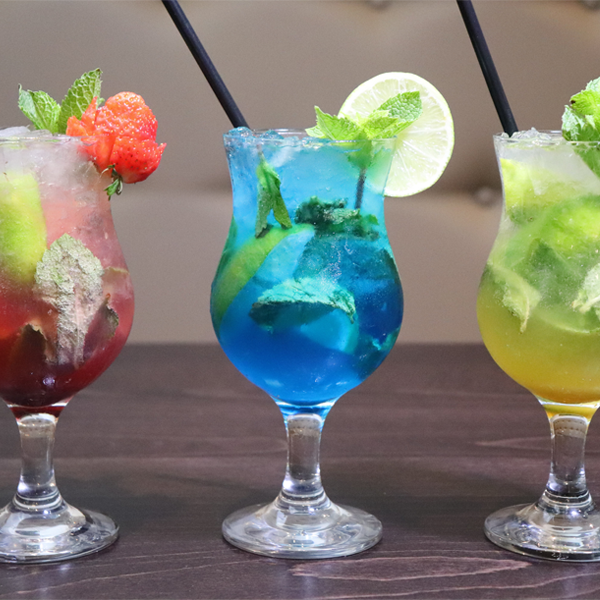 We have a passion for perfection and crafting our own flavours, that’s why we have a range of uniquely infused mocktails, signature shakes and refreshingly fruity juices to excite your taste buds. Why not try something new today? There’s always room for desserts! Our desserts bring a luxurious twist to the dessert dining experience. 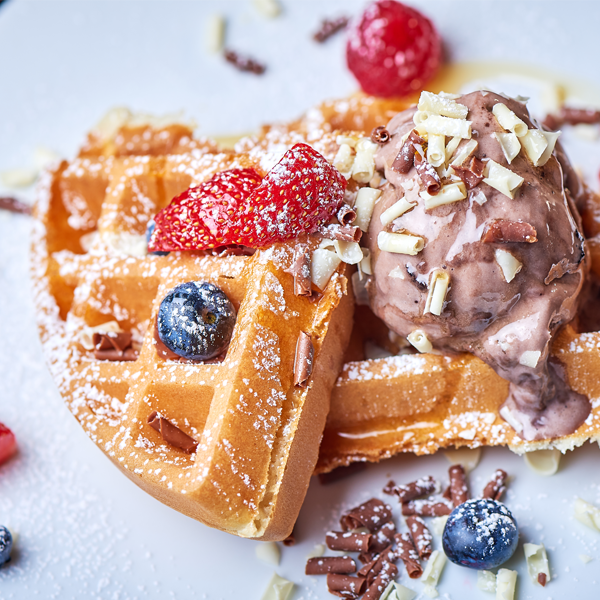 We offer a selection of tasty desserts from fresh waffles and crepes, rich cheesecakes, to our Fredo’s signature Luxury Gelato ice cream cart with a range of handpicked flavours including Salted Caramel, to the Nation’s favourite Oreo Cookie to satisfy your sweet tooth. Serving cakes, VIP shakes and more – the best things in life are sweet! Come Eat, Drink & Relax the Fredo’s Way! Second visit now...Great space, great food. Portion sizes were huge, very filling. Affordable. Nice atmosphere, Wheelchair access, patient waiters especially when your with a group of people (went with 10 ppl) and a request was never too much. ? Had an amazing night tonight. Booked for 50 adults and 15 children. Food was delicious with massive portion sizes. There was enough for everyone to take some home! Service was friendly and welcoming. Staff went out of their way to accommodate us. Would defintely recommend this place and visit again. Decor was elegant and comfortable. A great time was had by all. I ordered a margherita pizza. It was extra warm and cheesy which was brilliant. Then followed a cookie cream milkshake which was delicious and filling, and finally a refreshing mango sorbet. The hosts and waiters were also very friendly and inviting. It was worth the trip! Much-needed restaurant in Manor Park. The food and service are very good. Impressed that there are multiple vegan options. It was full yesterday so looks like it will do well. Visited with friends, I must say the haloumi chips are to die for. Waiters and waitresses were very good at taking orders they clarified my order and made sure it was correct. The aesthetics of the place were outstanding it felt as if I was dining in central London. I highly recommend this place if you need to go with friends or family.